Me and My Doctor: Why Should Texans Care About Bleeding Control? What Can You do to Help? Why Should Texans Care About Bleeding Control? What Can You do to Help? It’s possible to bleed from an extremity and die within three minutes. The threat is greater since the average response time for an ambulance is seven minutes and law enforcement is eleven minutes. Trauma is the leading cause of death under the age of 46 and the leading cause of productive life years lost under the age of 75. This can have a significant impact on Texans. Most of the potentially survivable deaths in trauma are due to bleeding, some of which can be easily controlled with basic life-saving techniques — techniques you can learn by visiting www.bleedingcontrol.org, or attending a Bleeding Control Basics class during National Stop the Bleed Day on March 31. In 1996, Frank K. Butler, MD, and colleagues published an article “Tactical Combat Casualty Care in Special Operations.” This spurred the creation of Tactical Combat Casualty Care (TCCC). It focuses on identifying and treating the three major causes of preventable death and emphasizes early tourniquet application (a device that constricts blood flow to an extremity thereby stopping blood loss). Preventable death happens when an individual’s injuries are not inevitably fatal and could be prevented with optimal medical care. There are three major causes of preventable death in combat — bleeding from an extremity, a collapsed lung that creates tension in the chest, and airway obstruction. The causes of preventable death are multifactorial, but by far massive bleeding is the major cause. One U.S. Army unit was able eliminate preventable death in combat — a feat never before accomplished by any unit in the history of combat. The 75th Ranger Regiment accomplished this feat by teaching every soldier how to identify and treat the three major causes of preventable death. Leadership involvement and following the guidelines published by the Committee on Tactical Combat Casualty Care (CoTCCC) were key to the success of the Rangers. We know tourniquets and hemorrhage (bleeding) control are effective in saving lives. In Iraq and Afghanistan, up to 2006 when tourniquets were just starting to be used, extremity bleeding caused nearly one in ten (7.8 percent) of total fatalities. From 2006 to 2011 however, just 2.6 percent of people died from extremity bleeding. That’s a 67 percent decrease in fatalities from extremity bleeding. How Does This Relate to the Public (Civilian Sector)? The Hartford Consensus, published in the wake of the Sandy Hook shooting, provides guidelines for people in active shooter situations. The concept is easy: early and definitive control of external bleeding through tourniquets and hemostatic dressings (bandages designed to quickly stop bleeding) would save lives and decrease preventable deaths. In 2016, a report titled “A National Trauma Care System: Integrating Military and Civilian Trauma Systems to Achieve Zero Preventable Deaths After Injury” helped identify the number of preventable deaths in the U.S. The report listed eleven recommendations aimed at better coordination efforts between the military and civilian experts in order to reach zero preventable deaths in the U.S. The report identified, of the 147,000 trauma deaths in the U.S. in 2014, 20 percent (or 30,000 people) could have survived with aggressive bleeding control and optimal care. Events like the ones that happened in Parkland, Sandy Hook, Boston, and Orlando show that an active shooter incident, or acts of terrorism, can happen anywhere and anytime. While a terrorist event catches everyone off guard, bystanders can be better prepared to save lives with a Bleeding Control Basics course. It’s very unlikely you will be in an active shooter or terrorist event, but it is more likely you will be present at a traumatic event caused by an accident. It could be a motor vehicle accident, a home accident, or at a place of employment. Regardless of where, proper training and preparation enables you to react and respond. You can prepare yourself by taking a Bleeding Control Basics course. This is an effort by the Stop the Bleed initiative, which has mutual involvement from the White House, the Department of Homeland Security, the American College of Surgeons, and the American College of Emergency Physicians. Everyone has the power to stop life-threatening bleeding caused by injuries in the home, industrial settings, or even mass casualty events. State and local government, medical groups, healthcare organizations, and local first responders share a mutual interest to inform the public that this training is available. This Saturday, hundreds of free Bleeding Control Basics courses will take place across for National Stop the Bleed Day. Click for information about taking a course. This initiative was started in September 2017 by current and former members of the U.S. Army and law enforcement. They recognized the need for civilian or bystander hemorrhage control in many situations before EMS arrives. 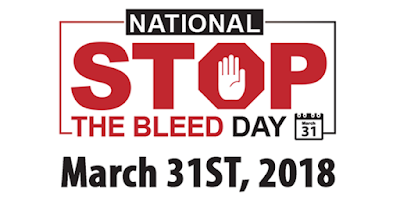 If you are interested in serving your community as a Bleeding Control Instructor on March 31 or any other time, please contact The National Stop the Bleed coordinators in your area at stopthebleedday.org or visit bleedingcontrol.org to register.